Your application needs to support Federated Single Sign-On, a common approach for an application to rely on an external identity provider. For web-based applications, Security Assertion Markup Language (SAML) is the standard. For mobile applications, many mobile solution vendors offer proprietary SDKs to provide support. Okta offers Okta Mobile Connect which is based on the SAML protocol. 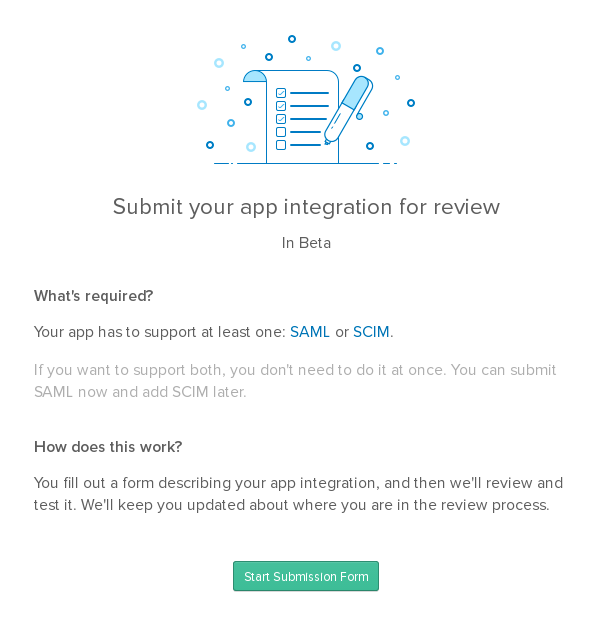 For details on how to federate your application with SAML and Okta Mobile Connect, go to our Single Sign-On with Okta section for additional guidance. Use Okta’s Single Sign-On with Okta guide for best practices on supporting SAML in your app which includes toolkits and testing tools. Sign up for an Okta integrator account. 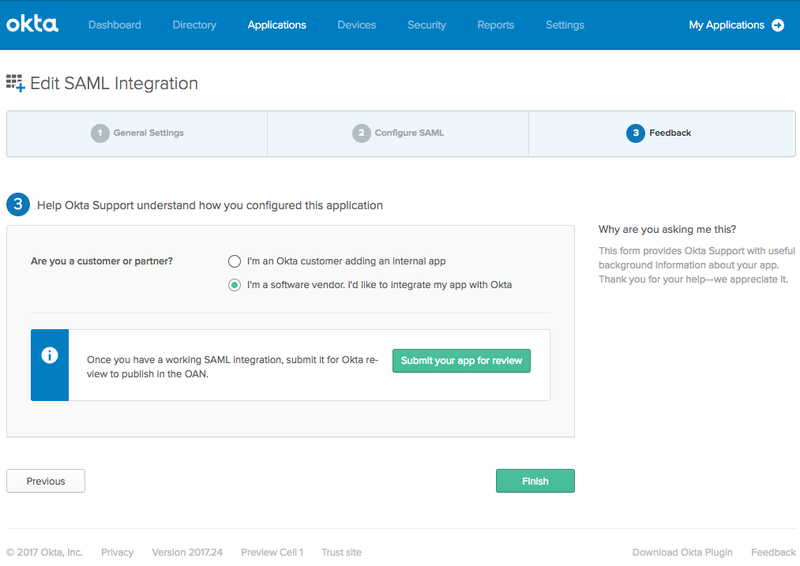 In your Okta account (make sure you are signed in as an admin), use the App Integration Wizard to build a Single Sign-on integration with Okta. See instructions for using the App Integration Wizard. 1. Select I’m a software vendor. I’d like to integrate my app with Okta. if you want your app added to the OIN. Okta won’t contact you until this option is selected. 2. Click Submit your app for review. You are redirected to the OIN Manager. 3. In the OIN Manager, click Start Submission Form, and enter the requested information in the General Settings tab. 4. 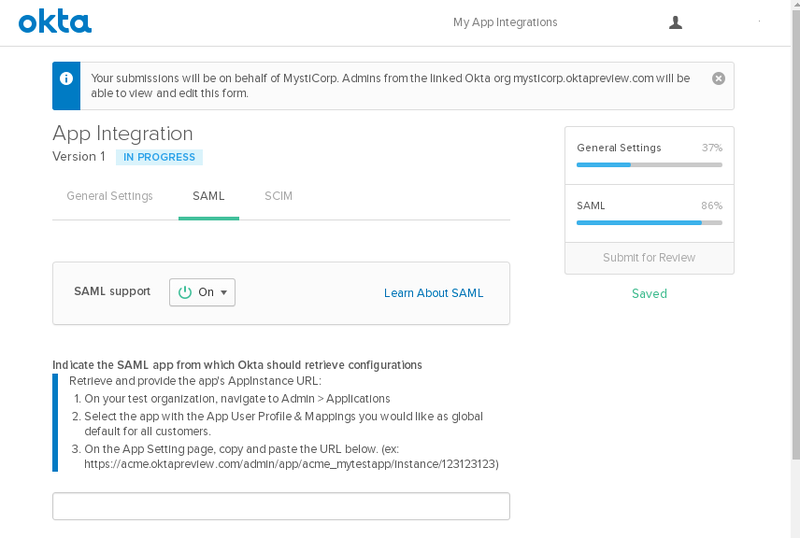 In the SAML tab, select On in the SAML support button, and enter information requested. 5. When you’ve entered all the information requested on the General Settings and SAML tabs, the Submit for Review button is enabled. Click it to submit your app for review. 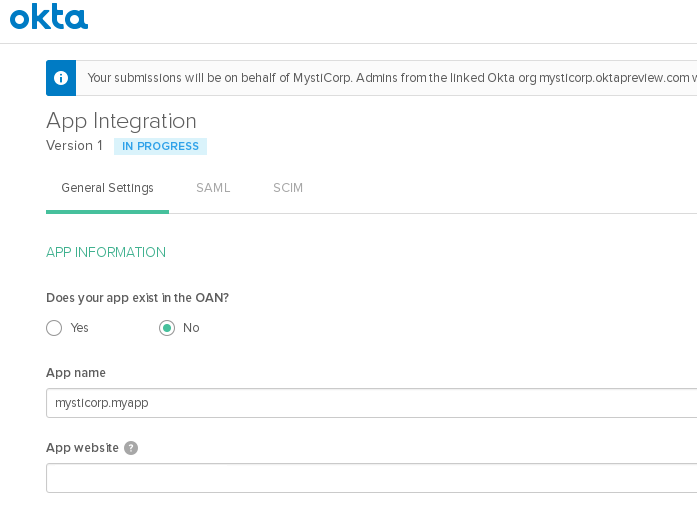 Once submitted, you can track the stage of your integration in the OIN Manager. Note: Okta doesn’t proactively add SWA-only, branded apps to the OIN. If you want a branded app in the OIN that only supports SWA to all customers, submit a request to [email protected]. Get stuck or have questions? See our Okta Integration Network FAQs (below), email [email protected] or post your questions on stackoverflow. Already part of the Okta Integration Network but looking for a more “go-to-market” partnership? Email [email protected] about becoming an Okta App Partner. App Partners are fully integrated with Okta and get access to great benefits like marketing support and a free version of Okta for your app.